Missouri pro David Ryan weighed the heaviest bag of the final round. David Ryan of Levasy, Missouri, weighed a five-bass limit totaling 17 pounds, 10 ounces Saturday to win the EverStart Series Central Division event on Lake of the Ozarks with a three-day total of 15 bass weighing 52 pounds, 7 ounces. For his victory, Ryan earned $32,917. 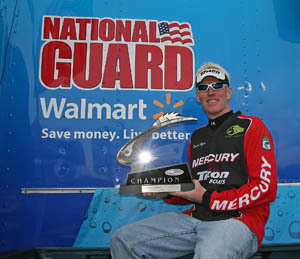 "I've fished tournaments a long time and had near-misses before at big events and this is really tremendous," said Ryan. "I'm super happy." Ryan was on quality fish throughout the course of the tournament and said he caught 12 to 15 keepers the first day of competition and 20 on the second day and was fairly confident of his chances of nabbing a win on Saturday. "I think I caught over 15 keepers today, and when I caught the 5-pounder I really thought that would solidify it," said Ryan. "I knew the (leaders) were going to have to catch them in order to win. I had put enough pressure on them in my mind that they were really going to have to catch them in order to beat me. But you always have that feeling in the pit of your stomach that you need one more. I was fortunate today, and what I caught today was enough." Ryan said he was fishing a "classic staging-area pattern" over a 10- to 12-mile stretch of water and fished a custom-painted suspending jerkbait on steep banks to catch his limits during the tournament. Jones caught the biggest bass of the tournament in the Pro Division Thursday - a 6-pound, 13-ounce bass - that earned him the day's EverStart Series Big Bass award of $272. Seventeen-year-old Kenny McGar of Crofton, Ky., won the Co-angler Division and a Ranger boat with an Evinrude or Mercury outboard motor with a three-day total of 12 bass weighing 31 pounds, 3 ounces. "This is awesome," said McGar. "It feels great. I'm on top of the world right now. "I've won a couple of small tournaments in the past, but this is my first big tournament," McGar added. McGar said he caught his two keepers Saturday shallow cranking - the same method he employed on Friday. McGar began the tournament Thursday fishing a jerkbait. McGar said he had never fished a jerkbait before Saturday's competition. "Those were my weapons of bass destruction for the weekend," said McGar. Epema caught the biggest bass of the tournament in the Co-angler Division Friday - a 6-pound, 2-ounce bass - that earned him the day's EverStart Series Big Bass award of $181. The next EverStart Series Central Division tournament will be March 31-April 2 at Kentucky/Barkley lakes in Gilbertsville, Ky., and is hosted by the Marshall County Tourist Commission.